The story starts off with the entire human race being surrounded by a mysterious light and turned to stone. Thousands of years pass with no trace of human activity or civilization. Taiju and his friend Senku wake up from their stony slumber and they start to rebuild society. This is an on-going Manga series published on Weekly Jump, written by Riichiro Inagaki and drawn by Boichi. There are two volumes released in Japan so far. 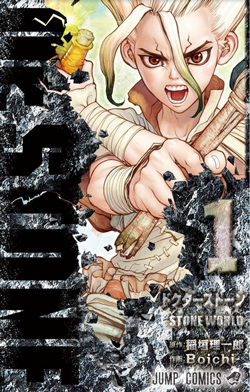 Dr. Stone is fast a paced adventure and you will get drawn into the unique use of science in the story!